Malo is said to have been a Welshman, but stories of his early life in Gwent where he was cousin to St. Samson, really belong to St. Machudd. 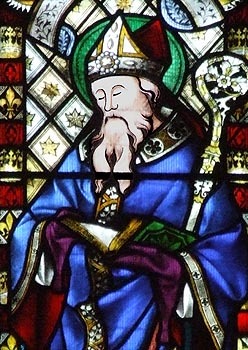 About the age of forty, Malo left Wales and crossed the English Channel, landing in Cezembre and entering the monastic school there founded by St. Brendan (perhaps St. Branwaladr in reality). This seems to have led to a belief that St. Malo was a companion of St. Brendan and accompanied him on his legendary voyages to the Orkneys and other islands of the far north. At any rate, Malo only stayed at Cezembre for three months, before moving on to the 'Isle of Aaron' (St. Malo) where he met the hermit, St. Airhan (alias St. Aaron of Aleth). Malo founded a monastery on the island and it became the centre of his missionary work in the area. This evengelizing took Malo to Corseul, near Dinan, where he restored a dead youth back to life. The usurper, Conomor, was King of Domnonée at the time and Malo accidentally bumped into him in that village on the Eve of Easter Day. The two celebrated mass together. Later, however, Malo seems to have thought it prudent to acquire confirmation of various land grants from a higher authority and travelled to the Royal Frankish palace in Paris, with seven other bishops, to see King Childebert. After Conomor's deposition and the accession of the rightful King Judwal, Malo was elected Bishop of Aleth (Saint-Servan-sur-Mer), on the mainland opposite his island home. On the death of Judwal's son, Judhael, a certain Royal official named Redwal decided to take power by murdering all of Judhael's sons except Haeloc, whom he would make his puppet. One of Haeloc's baby brothers sought refuge at Aleth, while Malo was away. Redwal, however, seized him and, despite plees from St. Malo for his return, killed the child right before his eyes. Haeloc persecuted Malo and his monks for many years, but eventually the two became friends. After his death, however, the monastery was unpopular for a whole generation. During this period, being sick and foreseeing his death, Malo requested that St. Gurval should succeed him. He is said to have died on 15th November, but this death date may properly belong to St. Marcoult. © Nash Ford Publishing 2006. All Rights Reserved.